I always wonder how these painters manage to get the "big picture" with the right proportions while working so close to their subject. Then I think of Michelangelo and the ceiling of the Sistine chapel and... well I realize it was pretty much the same, only the other way around. Anyway I love this photo (and yes the dog has a lot to do with it!). FYI, I took it at Beaubourg. The dog looks like he knows the routine. A very soulful scene. Have a great weekend, Eric. A dog doesn't go far from his master. He's happy if his owner is happy! Love the photo with the relaxed dog. I am suprised the painting doesn't smear with him working in the center (chalk?). Looking for ideas of a nice budget friendly hotel in the heart of Paris - let me know if anyone has ideas for this fall. Post or email to my hotmail account at mplslovesparis. Thanks PDPers. It would be great to just sit and watch this unfold. Excellent photo. I wonder the same, Eric! How clever these people are. That is so cute! The dog is just adorable. And you're right, the proportions on a painting this big would be difficult, unless you did it every day. Bonjour! Great shot, I think your photo is better than his drawing. I suppose the grid of the paving slabs makes it a bit easier in this instance. One of my favorite Chiostri postcards has a grid of squares penciled over it and I have other cards as well like that. Seems it was a common technique for an aspiring artist to teach himself how to draw, keep perspective and size ratios?? Imagine this artist has his own mini-pic with a grid overlay too. But...the dog! Best part of the pic:) Thanks again,Eric, for starting my morning with a special piece of Paris. Ooooh I looove the little dog sleeping while the artist works!!! I love the little dog as well. So cute. 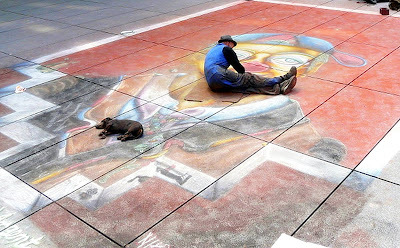 pavement painters plays a vital role in changing the cities because they can easily change a bad place into good one by using their painting skills. My artist/musician husband once told me how they do this (including Michelangelo): they use a series of dots to create a grid and have usually sketched out a line drawing on a small grid, then work square by square (or maybe in this guy's case, rectangle by rectangle, as he could use the sidewalk cracks as his grid) filling in a portion of the whole in proportion. But, I'm sure you knew this :-). I vote for this one to make it into the color calendar. The pooped pup is priceless. Wonderful capture! Eric, I haven't visited your blog in a while but since I'm updating mine again lately I thought I'd take a trip around the world...this is a wonderful photograph!